The lake is a wild and elemental place at sunrise, mist floating on the water and draping the shoreline, here and there the call of a loon, the susurrus of a heron striding the shallows, the ripple of pike or perch rising to the surface and then falling back into the depths. 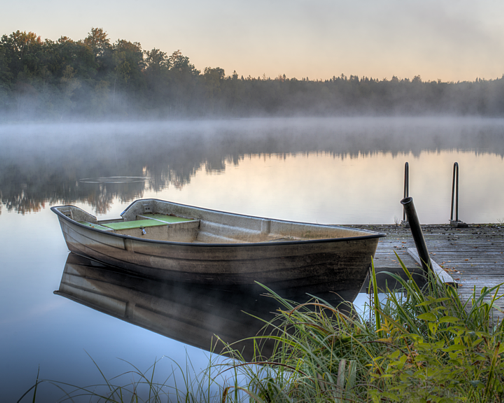 The weathered boat and wooden dock are human constructions, and in ordinary terms, they are anything except mysterious, but in early daylight, they take on the fey trappings worn by every foggy inland sea at sunrise. Invoking the image, she can almost hear waves lapping the shore, and the sound is as peaceful as a bell calling her to church or temple or meditation. Everything she needs, everything in the world that matters, is right here, and she has returned to this quiet scene often in recent weeks. Simply beautiful - words and image. Thank you. Thinking of you, good thoughts your way. Perfection! Such a serene setting, and reading what you wrote is like a little meditation. Thank you! This is a stunning photo. So beautifully framed.